They say that all good things are worth waiting for. And nothing makes that statement truer then the long awaited opening of L’Opera Restaurant at the Palais Garnier, home of the famed Paris National Opera Company. Charles Garnier, architect of Napoleon III’s stunning new opera house, always intended that a restaurant be included in the completed cultural center, but construction difficulties, a series of unsuccessful and expensive foreign wars and finally the resulting collapse of the government precluded the restaurant ever being established. Even more recent attempts in 1973 by Rolf Liebermann and in 1992 by Pierre Bergé failed to complete Garnier’s final dream – all due again to the huge costs involved. Yet as all true opera lovers know, a great aria and fine food belong together as truly as, well, any romantic tenor and dreamy-eyed soprano do, at least according to Rossini and Donizetti. Now, thanks to Jean-Phillipe and Pierre-Francois Blanc, the injustice of legendary music without memorable cuisine has been corrected. Key to their success as the restaurant’s new owners, is their ability to bring together a team whose talents equal the legacy of Garnier’s grand house. 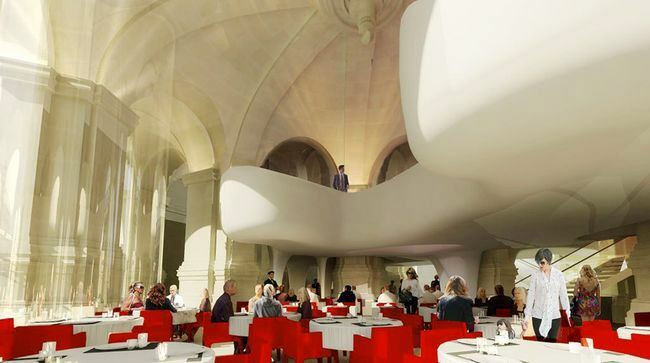 First among their choices was the very modern architect Odile Decq, who seemed at first an unusual designer for a restaurant set in a venerated historical building. 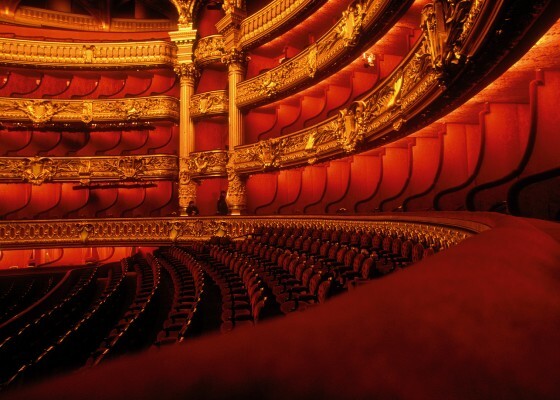 To make matters worse, the Garnier Opera House is listed as an architectural treasure by France’s National Commission of Historical Monuments, which means absolutely no structural changes are allowed. But have no fear. Odile Decq’s fame is not undeserved for she understands that the essence of design is an insightful understanding, not mere copycat dupliction. 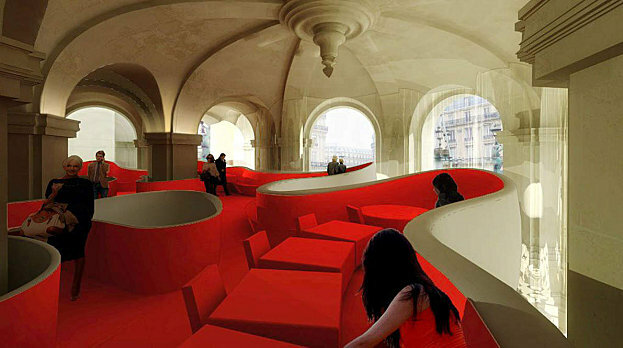 Drawing on the elegant red crescent of the Opera House interior, she created a contemporary free-standing two level installation that honors both tradition and modernity. Yet art, either on the stage or in architecture, is not inexpensive. 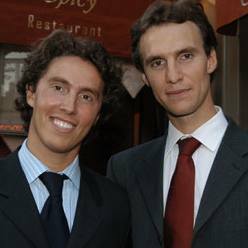 All in all, Jean-Phillipe and Pierre-Francois have invested over six million euros to get it right. Second, but of equal importance, is the elite culinary team they have gathered together. Chef Christophe Aribert, formerly of Les Terrasses, Grenoble’s lovely 2 star Michelin restaurant, has taken charge of the menu. Working with Chef Aribert is the Executive Chef Yann Tanneau, previously of Mama Shelter, Sous-Chef Didier Quennouelle of Le Fouquet’s and finally the Pastry Chef Hervé Moreau, formerly of Pierre Gagnaire and Michel Rostang. What a team! What a setting! As the word “Opera” means “The Great Work”, truly no better name could be found for this new restaurant, a culinary jewel sure to soon set its lucky diners shouting “Bravo, Bravo, Bravo” throughout the streets of Paris and beyond! Posted on July 8, 2011 by Ana Kinkaid and filed under Architecture, Chefs, Culinary History, Design, Elegance, French Cuisine, Hotels, Michelin Guide, Restaurants and tagged Charles Garnier Chef Christophe Aribert Chef Didier Quennouelle Chef Herve Moreau Chef Yann Tanneau Jean-Phillipe and Pierre-Francois Blanc L'Opera Restaurant Les Terrasses Odile Decq Palais Garnier Paris Paris Opera.